Want to Achieve More of Your Goals More Often? How do you feel when you fail to achieve a goal? Now that you have considered the question of how you feel when you fail, consider this: If you don’t write down your goals, this question won’t be as powerful for you. People who write out their goals and plans to achieve them typically achieve more and attempt more difficult challenges. If people who write out goal plans stretch themselves more, they may fail more often because of the potential increase in difficulty of their goals – or less often because they actually plan to succeed. One thing is for sure, people who write down their specific, measurable, time-bound goals will know – for sure – when they have succeeded or failed. Most other people are mistaking success for fortunate circumstances and that “uncomfortable feeling” they experience as failure. Failure is not so debilitating for the person with specific written goals; they know what to correct in a second effort. 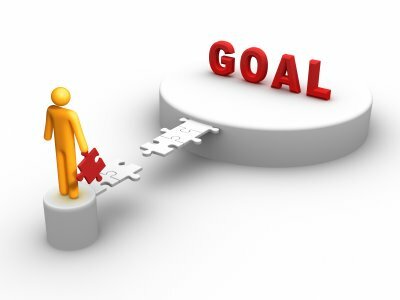 Goal setting is the means by which you can define your ideal future, motivate yourself to achieve that future, identify possible distractions and potential road-blocks so that you can develop solutions to problems before they occur. Goal-setting begins with your answers to the question, “What do I want?” You can never have too many answers to this question. What do you want to do? What do you want to have? What do you want to become? You CAN have too many goals. So your next step is, considering all that you want, “What is most important to me now?” This question should be answered in the context of your values (again, purpose-driven, goal-directed people have their values written down). People of faith will seek to discern what is most important to God in defining their goals. Why is this your goal? What would it mean to you, in deeply personal terms, if you achieved your goal? What would it mean if you did NOT achieve your goal? Your answers to these questions define your motivation to achieve the goal. What might keep you from achieving your goal? What obstacles might get in your way? If the goal is much of a goal at all, there will be obstacles and several of them. If you can’t think of anything that might prevent success, then consider why you haven’t already achieved the goal. For each of these roadblocks, consider possible solutions. These solutions become the object of your action steps. Top goal achievers don’t practice the common approach to goal-planning; that is, set your goal and consider your action steps. Top achievers also consider the “Why” of their goals and the obstacles that they must overcome to be successful. Give us a call at 217.362.0500 or email askthecoach@pdncoach.com if you are interested in learning more about the power of coaching and the habit of Goal-Achieving. We’ll merely get acquainted – we don’t charge for making friends! This entry was posted in failure, goals, Purpose, success. Bookmark the permalink.